THE FIGHTING CHAMP (1932, Monogram) Bob Steele, George “Gabby” Hayes, Arletta Duncan. A very good Monogram pic with Bob as a drifting cowboy who's turned down for a job by a ranch-boss. A fight erupts and Bob knocks the guy cold. Little does he know that the boss is supposed to represent the ranch in a prize fight against a middle-weight pro. Before long, Bob's in the ring himself with his life on the line. This is a g-r-e-a-t B western. From 6mm. ALIAS JOHN LAW (1935, Supreme) Bob Steele, Roberta Gale, Buck Connors, Earl Dwire. A top Steele Supreme. Bob gets in a shootout between a marshal and outlaws. Bob is deputized. Later, he finds out the head of the gang is impersonating him so he can take over some valuable land that Bob is heir to! Bob’s deaf saddle-pal, who can read lips with a telescope from hundreds of yards, helps Bob get the goods on the bad guys. Dwire is a really ruthless SOB. From 16mm. 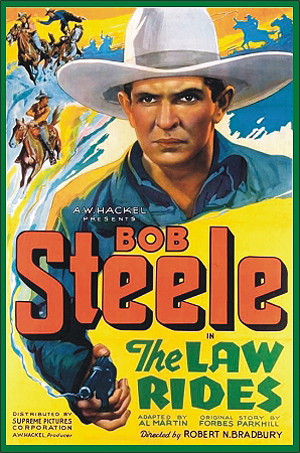 THE LAW RIDES (1936, Supreme) Bob Steele, Charlie King, Harley Wood. Bob’s buddy strikes it rich. Charlie murders him though, before he can file a claim! Bob trails Charlie in hopes of finding his dead friend’s secret mine, but gets hog-tied and left in the desert to die! A fine Supreme western. 16mm. LIGHTNIN’ CRANDALL LIGHTNIN’ CRANDALL (1937, Supreme/Republic) Bob Steele, Lois January, Horace Murphy, Charlie King. Bob’s got the fastest guns in Texas. He leaves for Arizona, hoping to find freedom from the flow of cheap gunmen who continually challenge him. Trouble follows though, in this great western thriller. The long brawl where Bob beats the crap out of Charlie King is a knockout! From 16mm.